We've spotted a boatload of your weird medical questions on the horizon and we've pointed our knowledge cannons at it and we're ... sinking it? Listen, the metaphor got away from us. We're sorry. Dr. Sydnee and Justin asked why you, their beloved listeners, haven't gotten a flu shot and now they're taking 27 (yes, 27) of your most common excuses and blowing them to smithereens. Dr. Price was a dentist with some pretty bad ideas about nutrition. That probably wouldn't have merited an appearance on Sawbones ... except those bad ideas went on to inspire a terrifying modern following. This week Justin and Dr. Sydnee try desperately to save you from cholera on a grand tour of the many different ways to die on The Oregon Trail. You had to see this one coming. Yes, just a few short weeks after Justin's surgery, Dr. Sydnee decides to explain the complete history of vasectomies in excruciating detail in front a few thousand of their closest friends. We take for granted that we know what bodies look like on the inside, but this week on Sawbones we honor those brave pioneers that had to draw them for the very first time. 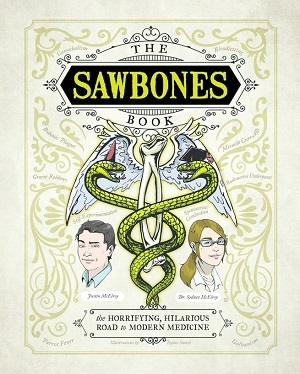 Also Dr. Sydnee and Justin explore the scandal behind the most famous book of medical illustrations. This week on Sawbones, Dr. Sydnee and Justin discuss what we owe to people who do terrible things in the name of medical progress. People talk a lot of mess about drugs being dangerous, and they're right. But did you know that ether frolics, a delightfully named drug party, inspired a powerful anasthetic? It's true!